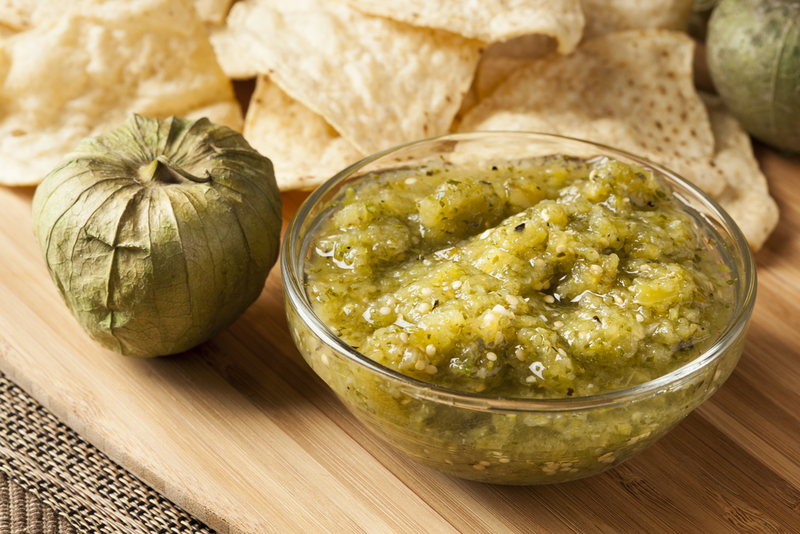 Salsa… it’s a must! Every one should have a good go-to salsa recipe. It is a staple at parties, a good midnight snack, a fantastic topping for lots of items, and just something most folks have in their fridge at all times! A good salsa always consists of fresh ingredients. There is nothing like fresh salsa! The canned and jarred stuff doesn’t even come close. The recipe calls for fresh tomatillos, which look like little green tomatoes. You can usually find them in your produce section at your local grocery store. If you need a whole bunch of them… contact the produce department and they can order in a box just for you! Depending on what part of the country you live in, tomatillos are harder or easier to find, so if you aren’t sure, it’s better to contact the grocer. This salsa also calls for serano, poblano, jalapeno, and hatch peppers! Peppers usually have a waxy skin that you don’t really notice until they’ve been cooked and it doesn’t really taste that fantastic in the salsa. Once you roast your peppers, you’ll see what we are talking about. Usually, you can just peel it right off after you’ve pulled them off the grill. Just be careful! They will be hot hot hot! Don’t stress yourself out by making sure to get every last piece of skin off the pepper, just get as much as you can. Another tip and trick is to make sure you de-seed and de-membrane the peppers before you put them in the food processor. Seeds and membranes in peppers make the salsa spicier. Peppers are spicier when they are in season as well! If you like spicier salsa, leave some or all of the seeds and/or membranes in the peppers. A food processor gets the best results regarding consistency of your salsa… it will grind everything down rather than pureeing it. Not to worry if you don’t have a food processor, just pulsate your blender blades and that will help do the trick. For more information about this recipe and about Pit Buddies BBQ Recipes… check out the full sch-peel here. Prepare your Hasty-Bake for grilling. You will want to get a slight char on all of your veggies. You probably won't need your heat deflector and can raise your fire box to sear initially and then lower down toward bake as your veggies start to char. Remove husk from tomatillos and rinse vegetables. As vegetables finish (all won't finish at the same time) remove them to a plate or cookie sheet. Place peppers in a gallon-sized plastic resealable bag- This will help the skin separate from the meat of the pepper and make them easier to peel. Once all vegetables are off the grill, peel peppers and remove seeds and membranes. 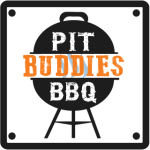 Pit Buddies' favorite recipes, tips, tricks, & true stories we made up, dedicated to all things smoking, grilling, & our quest to become backyard legends!